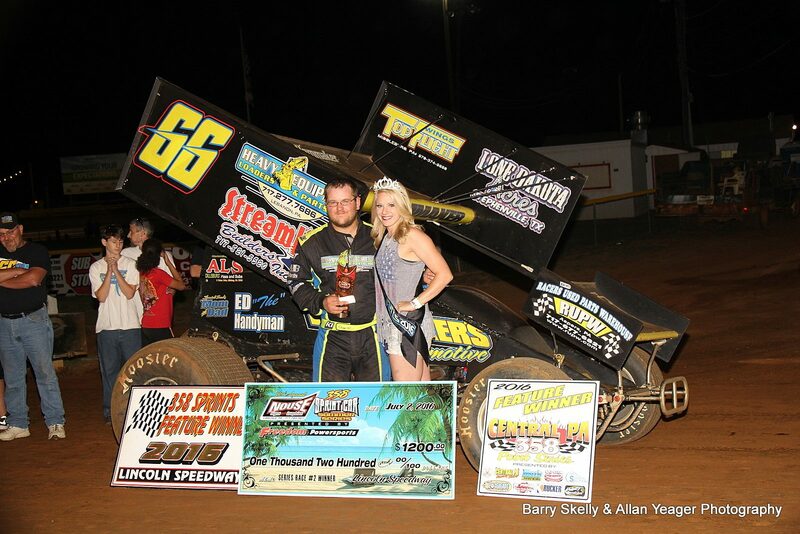 ABBOTTSTOWN, PA, 7/2/2016 –Social media discord and a family feud may have been among the things that inspired Doug Hammaker to score his second Lincoln win of the year in the second leg of the Nouse Signs & Graphics 358 Summer Series event on Saturday night. “We don’t run this car a lot, continued Hammaker, “Last night at Trail-Way we hurt the motor in the red car, so we changed the car around at 1:00 this afternoon. The old man ain’t here, so I kinda set it up myself…so I might have bragging rights this week. A tenth-lap crash involving the second, third, and fourth-place cars was the only race stoppage in the 25 laps. Jake Eldreth, who was running second made contact with Matt Campbell and flew into the fourth turn catch fence. Collected in the incident was fourth-place Chris Arnold. Eldreth received a check-up from the track EMTs after complaining of head pain. Hammaker was placed fourth for the restart, moved past Kyle Denmyer into third on lap 18, and then drove under both Kevin Nouse and race-long leader Steve Drevicki entering turn three of lap 22. From there, he drove away to his sixth career win and the $1,200 top prize. Second through fifth were Drevicki (in his best ever Lincoln finish), Nouse, Adrian Shaffer, and Denmyer. Heats for the 41 358’s on hand were won by Denmyer, Jordan Givler, Shaffer, and Brent Shearer, with Phil Walter winning the consolation. In another late-race pass for the win, Jaremi Hanson drove under Colby Dice exiting turn two of the next-to-last lap to score his first Lincoln win in the 20-lap PA Sprint Series feature event. Hanson actually started on the pole, but yielded the top spot to fourth-starting Dice at the outset. He chased Dice the entire way before making the race-winning pass. Dice settled for second, with Rick Stief, Dave Brown, Jr., and Drew Ritchey completing the top five. Heats for the 29 PASS/IMCA (305) Sprints on hand were won by Hanson, Zach Burd, and Stephanie Dodson. Aaron Bowes celebrated his 23rd birthday by holding off point series leader Korey Inglin in the 20-lao Xcel Modified feature. Bowes started on the pole and led in the early going before Inglin took the lead. Bowes reclaimed the top spot at mid-race in the caution-marred event. Inglin crossed second, with Nate Brinker coming from the back after an early race spin to finish third. Richie Hitzler and Tyler Bartik rounded out the top five. Heats for the 31 600 Xcel Modifieds on hand were won by Bowes, Brinker, and Inglin, with Bartik winning the consolation. Next Saturday night, July 9th, Lincoln Speedway will complete the originally scheduled April 30th 13TH ANNUAL WELDON STERNER MEMORIAL for 410 Sprints, plus a complete regular show of 410 sprints, 358 Sprints and All-American Outlaws. The regular portion of the 410 show will be opening night of the 410 sprint car “Shootout,” with the other two legs to be run at Trail-Way Speedway on Sunday night (7/10) and at Susquehanna Speedway the following Sunday, 7/17. Gates will open at 5:00 PM, with racing getting underway at 7:00 PM.